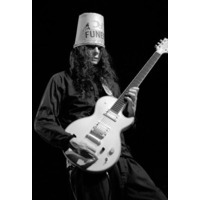 Brian Carroll (born May 13, 1969), better known by his stage name Buckethead, is a virtuoso guitarist, and multi instrumentalist who encompasses several genres of music. He has released 30 studio albums, 4 special releases and an EP as of 2010. He has performed on over 50 more albums by other artists. His music spans such diverse areas as progressive metal, funk, blues, jazz, bluegrass, and avant-garde music. When performing in his theatrical persona, Buckethead used to wear a KFC bucket on his head, emblazoned with an orange bumper sticker that reads "FUNERAL" in capital black block letters, and an expressionless plain white costume mask. More recently, he has switched to a plain white bucket no longer bearing the KFC logo. He also incorporates nunchucks, robot dancing, and toy trading into his stage performances. Buckethead's persona represents a character who was "raised by chickens" and has made it his "mission in life to alert the world to the ongoing chicken holocaust in fast-food joints around the globe." An instrumentalist, Buckethead is best known for his electric guitar playing. He has been voted number 8 on a list in GuitarOne magazine of the "Top 10 Greatest Guitar Shredders of All Time" as well as being included in Guitar World's lists of the "25 all-time weirdest guitarists" and is also known for being in the "50 fastest guitarists of all time list". Buckethead performs primarily as a solo artist. He has collaborated extensively with a wide variety of high profile artists such as Bill Laswell, Bootsy Collins, Bernie Worrell, Iggy Pop, Les Claypool, Serj Tankian, Bill Moseley, Mike Patton, Viggo Mortensen, and was a member of Guns N' Roses from 2000 to 2004. Buckethead has also written and performed music for major motion pictures, including: Saw II, Ghosts of Mars, Beverly Hills Ninja, Mortal Kombat, Mortal Kombat: Annihilation, Last Action Hero, and the main soundtrack of Mighty Morphin Power Rangers: The Movie.